Population profile maps are those that show an overview of demographic statistics in the census in the United States. This map shows Florida with the dark blue colors show the higher population. 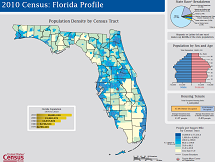 Besides the large picture of Florida, the map also includes a racial pie chart, a population pyramid, and a housing occupancy rates bar chart. All of this information together represents what is taken in each census. This information was taken from the 2000 census.